Children’s Action for Development (CAD) is a local Cambodian NGO, founded in 2006 by Bunrith Thy (Racky). 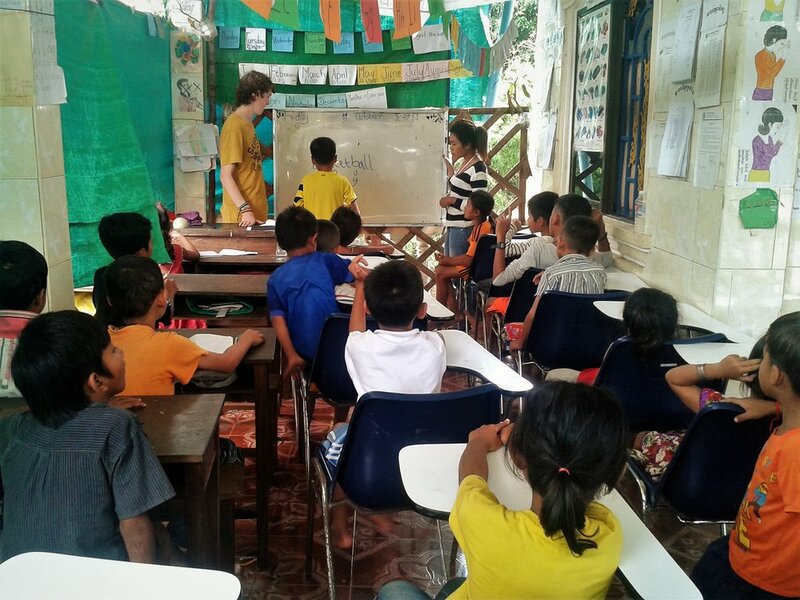 CAD programs focus on improving the education system in Cambodia and every child’s access to it, working on the reduction of child labor and the reintegration of all children into formal school systems in Battambang. To reach these goals, CAD runs a range of programs: supplementary classes to primary school students, assisting public schools to become child friendly schools, providing social services to the children’s families, raising awareness and providing training in parenting skills and children’s rights within the communities. CAD recently started a pilot program to provide poor families with income generation and sustainable livelihoods. ECHO recognizes CAD’s important work in the wider Battambang area and decided to support its positive impact on underprivileged families, and the structural change it brings in its collaboration with government and national partners. Since its start, over 5000 children, 200 teachers and 25 public schools have benefited from CAD’s services so far. CAD ensures it does not work in isolation. CAD has been an integral part of the education networks in Cambodia for many years, being a recognized member of NEP (NGO Education Partnership), KAPE (Kampuchean Action for Primary Education) and BEST (Battambang Education Support Team). This approach allows CAD to have a structural and well-founded impact on children’s futures in Cambodia. What do they do for the children and their families? 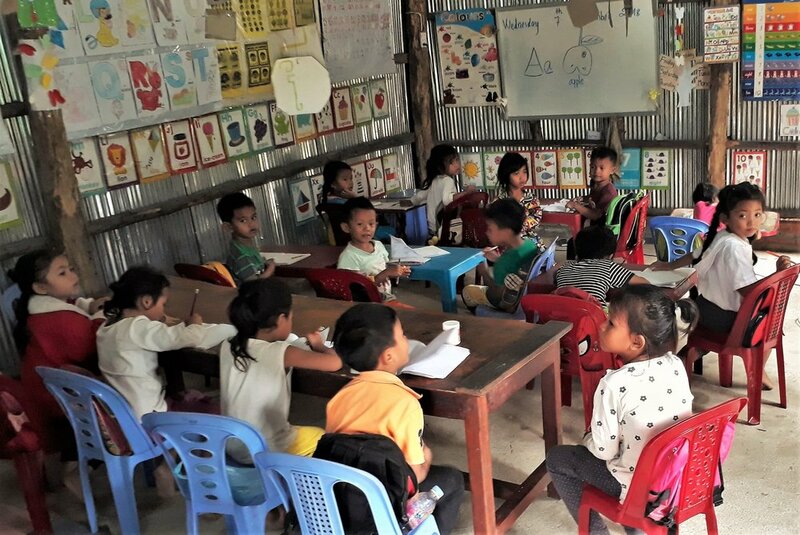 CAD provides several key services to the poor communities around Ek Phnom, north of the city of Battambang, and works on the improvement of the primary schools in the area. They run four major programs. Through three education centers inside the communities, CAD provides supplementary classes to primary school students. Over 360 children attend the centers every day, receiving Khmer, Math and English classes. Twenty children attend kindergarten, ensuring their parents can go to work and provide for their family. All children receive the necessary school materials. They provide water and nutritious snacks during breaks. Each center has a library, providing the children and teachers access to reading material and educational support. The children create and maintain vegetable gardens around the schools. They provide sports classes after class hours and currently have 6 football teams (including two girls teams) who even compete in other towns. The centers are self-constructed on property rented from the communities it serves. CAD has turned the centers into lovely and peaceful playgrounds, where the children also help maintain vegetable gardens. CAD’s social workers follow up with the families and visit the public schools. They provide advice and referrals to the family. They also provide training to the parents about importance of school and the reduction of child labor. Training includes the impact and hazardous risks of migrating for work, drug usage and child trafficking. CAD assists the government in the implementation of the national Child Friendly Schools program for Cambodia’s public schools. Many are in a dire state. The program aims to improve many aspects of the public school system, including rudimentary educational facilities, poor teacher qualifications, and low educational relevance. CAD assists 12 public schools in their transition, improving the quality of education to over 3500 primary school students on a yearly basis. Every year, CAD develops a school improvement plan together with the schools, based on an assessment of three subsets: capacity building & school planning, school improvement activities, and community outreach & engagement. Creating maps of the school catchment areas: identifying the homes of children who should be attending primary school. Supporting over 400 scholarship students with materials, remedial and life skills classes. This also includes visits at school and home. Recruiting and training community teachers to work in schools where there are teacher shortages. Establishing Child-To-Child networks, where older children are encouraged to mentor younger students. Forming and activating student councils. Carrying out infrastructure improvements, including providing clean water and sanitation, classroom enhancement, bio-gardens and playgrounds. Recruiting and training community members to join School Support Committees and mentoring these committees to work with school directors to improve conditions. Working with the District Office of Education staff to conduct monitoring visits to schools. Working with staff from the Provincial Office of Education to facilitate workshops and training. In 2018, CAD built a vocational training center, where community members learn a craft and afterwards sell their creations. Tourists are welcome to visit and buy locally made products (clothes, woven bags, purses, and others). There is also a computer classroom. After school and work, a part-time computer teacher provides MS Office to members of the community on a daily basis. CAD has recently been selected to help implement the TIGER Project of Belgium’s VVOB in Battambang Province. The TIGER project aims to ensure primary and lower secondary school children are protected from school-related gender-based violence, enabling their equitable participation in all spheres of life at school and at home. Racky, CAD’s founder and Executive Director, grew up in the wake of he devastating Khmer Rouge regime and experienced a youth of poverty, with little access to education and having to work in the fields to support his family. Studying by himself as a young adult, Racky managed to become a teacher and started building his career working for different NGOs. In 2006, these experiences inspired him to start his own NGO, primarily focusing on giving back to his communities through essential education programs. CAD has known challenging years. As Racky did not have a network to rely on for CAD’s funding, he continued to work in tourism for many years just to be able to pay teacher’s stipends. Carefully, Racky made sure CAD could grow at a healthy pace. In 2011, he received his first real break: Future Sense Foundation decided to step in and provide the NGO’s first significant funding to develop the supplementary classes. Shortly after, CAD received a second big boost from Australian friends who started funding the ‘Child Friendly Schools’ program. Since then, Racky has been building high quality programs with a small but motivated team, while maintaining his knack for austerity. Building classrooms with recycled materials and using land from the communities it serves, are just a few examples of how CAD achieves a lot on a very low budget. In 2017 CAD managed to provide all its services for $ 91.317 per year. All received donations go directly to the programs. CAD does not use a budget for online communications or marketing purposes. For 2018 and 2019, CAD will have a higher total budget thanks to the new funded programs (Vocational Training Center, TIGER).